Please forgive the quality of these pictures, I snapped them with my phone. There is a local bi-annual consignment sale for children's toys and clothes here. 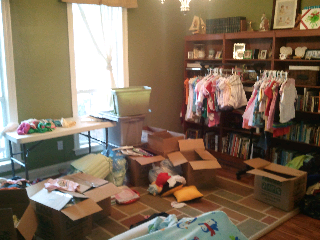 My living room has been taken over by stuff. Everywhere. 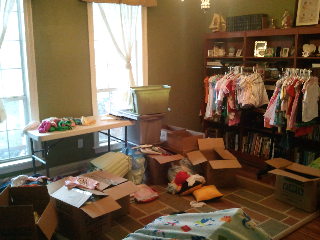 Over the next two weeks I will be sorting, pricing and tagging all of it. Unfortunately, that table by the windows is where I sit and do my crafts and sewing. That means I can't do anything right now. I did not realize that I had put quite this much stuff into storage. After this consignment sale I plan to do a garage sale for any remaining kid's stuff and the adult items that couldn't go in. After that, Goodwill is going to get a donation of what was left. I realize now this is the same angle in both the pictures. Imagine twice this amount of stuff. Missing from the picture are the two girls pointing out everything trying to make reasons why they need to keep a toy that they are far too old for, or the two dogs who think the best place to sit while I do this would be my lap. I will put a shot of the clean area soon.